Bought as a gift for a friend who did not like it. It was too high and she got head aches. She gave it to her son and he just loves it. 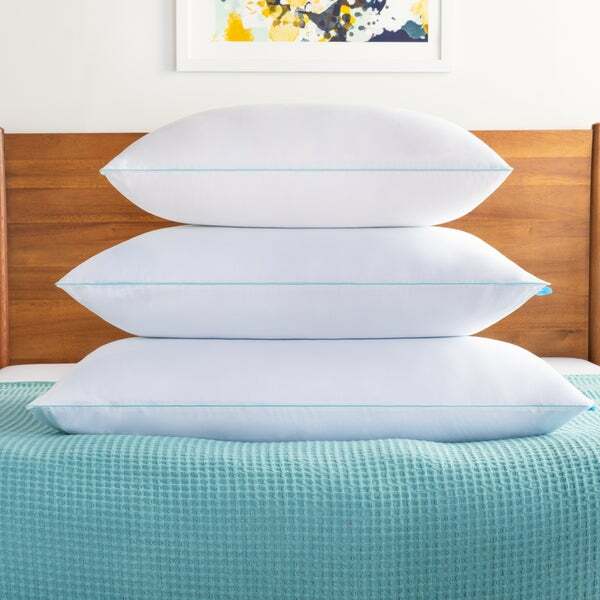 This deluxe shredded memory foam pillow from LINENSPA Essentials gives you the benefits of memory foam with a feel more similar to a traditional pillow. The shredded memory foam fill makes the pillow breathable and easy to fluff, while an outer layer of gel-infused memory foam helps it stay cooler and provides a consistent feel throughout. The included 250 thread count cotton cover is easy to remove and wash as needed. II have really enjoyed sleeping on this pillow! I was sent this pillow as a product test from the manufacturer. When it arrived, I was concerned that it would be too firm, but it forms so nicely around your neck and head that it is amazingly comfortable. I've had quite a bit of shoulder pain when I sleep and unexpectedly this pillow relieved much of that. I love the support it gives. I did not notice an off odor with my pillow and after opening I just let it sit a few hours on my bed before using. It fluffed up nicely before bedtime. Great product would definitely recommend! Updating! I've continued to use this pillow every night! It looks just like it did when I got it. The loft is still the same - it hasn't squished flat like many regular pillows have for me in the past. I thought you might like to see a few fun comparison pictures for the loft and "squish" (I'm sure there's a technical term for that but squish is what it does when I sleep on it and that's good enough for me!) The measurement of inches doesn't do much for me unless I have a ruler handy - so I chose a few of my favorite products to compare with: 1 - My pillow is just over the height of a Hershey bar... which is 6 inches. 2 - The average weight of a human head is 8-12 lbs, so I chose a gallon of milk (which weighs just over 8 pounds) to set on the pillow to show how much it sinks when you lay your head on it. I'd say not quite half. 3 - I can press a little deeper with my hand and when I let go the pillow fills right back up to the full Hershey Bar height. 4 - I love the protective cover on the outside of the pillow. Nice little zipper that allows you to wash that case if it becomes soiled through your pillowcase. You can see the shredded foam inside but it is shredded and packed so well that you don't feel any distinct pieces. It feels like one solid form. I have really continued to enjoy this pillow as it supports my neck and head well. It is much more firm than I've slept on in the past but so comfortable. This pillow is fantastic! I received this pillow for a product test, and to be quite honest I was surprised when I saw the price. I honestly thought this would be a much more expensive pillow! Upon opening the pillow, we found it compressed for packaging. It advises to let the pillow rise for 24 to 48 hours, but honestly it looked useable after just a few hours. There was a slight odor, but that is common for memory foam pillows. I didn't notice the odor after the first 24 hours. I left it outside a pillow case during this time, so that may have helped. The shredded memory foam gives this pillow a different feel than your standard memory foam pillow. It feels a bit closer to a standard pillow than standard memory foam pillows do. It is a very dense pillow (feels heavy), but it is very soft. This pillow is very easy to bunch and shape how you would like. This allowed me to get great support on either my side or back. Pros: Very well made, strong fabric Lots of support for any position Cons: 24 hour wait before using Having to share because everyone wants one It is only physically supportive. As of yet it hasn't provided any emotional support. Fantastic pillow. I would definitely recommend it. I was given this pillow from Malouf to test out and I REALLY love this thing!!! If you are like me and you need a thin firm pillow to get a good nights sleep, this is the pillow for you. Most memory foam pillows are too bulky or thick for me to get comfortable at night, this pillow is the perfect size and has just the right amount of memory foam. The gel really helps. The LinenSpa 8-inch mattress for the Giselle daybed was so wonderful, I got pillows to match. I purchased two Linenspa gel infused shredded memory foam pillows. They're good quality, well priced but a little firm for a shredded memory foam. I have purchased 4 pillows this year from other places and paid alot more. Then I gave them all away because I couldn't sleep on them. I decided to try one more time when I say this pillow on line, after all I was in the stores when I purchased the others and that didn't work out. When you take it out of the box it is vacuum sealed. Once you unseal the bag and take it out it begins to take shape so don't be alarmed. Instructions say it can take up to 72 hours to regain its shape. I slept on it the first night and it is the best pillow I've ever had. Nicely made and sleeps great. They warn you about a possible odor but I didn't experience any odor. Terrific pillow. Great for use as a bed pillow, also use it in a wheel chair for sitting or in a chair. The shredded Memory Foam plus the gel makes cool and soft. The pillow is surprisingly light weight. It is so comfortable to sleep on! I have been sleeping on it for a week now and have been extremely pleased. It also can be compacted for travel! If you have know that you like memory foam it is a great pillow! It is so supportive and comfortable to sleep on! The memory foam pillows is a new experience for me. They are so comfortable and soft. The thickness of the pillows are just right and they keep their shape, never flat. I love them. I've had this pillow for a few months and it is still just as fluffy and comfortable as the first day I received it, highly recommend! I got this pillow in desperation - having spent hundreds on down pillows, "side sleep" pillows, tempurpedic pillows, you name it. I'm a side sleeper and have broad shoulders and most pillows were too flat. This one is different. It's firm but soft and it doesn't compress over time. That means that when you lay your head down, the loft you feel in the first minutes will be the same hours later. Love this pillow! Ordered these first for my granddaughter who loved them! Decided to order two for myself. She was right - these pillows are wonderful! I've been searching for a new head pillow and came across this one. I was weary since I couldn't actually feel the product in person. I read countless reviews and thought this one was priced well and sounded like a good buy. The pillow expanded within 5 minutes as soon as I unpacked it. It feels plush but keeps firm to allow support and not have your head sink too far down into the pillow. I'm a side sleeper and I look forward to sleeping with this daily! It's wonderful, I would definitely recommend. This is a quality pillow. I love that the foam is not one big piece so you can adjust the pillow to suit you. It is extremely comfortable and the gel cooling works well too! After many failed attempts to find a decent pillow at department stores, I found these pillows. My partner and I sleep so much better with these pillows. Thanks overstock! Great on the price...still getting use to the pillows so far so good would like to recommend them. Love the quality and feel of this pillow, it is perfect. Great nights sleep on these pillows. Very comfy. Wasn’t sure what to expect but happy with purchase. Will buy others to match for my bed and guest room. Versatile. I know it’s new so it has that sturdy feeling. Comfortable. Waiting to see what month 4 brings. My son was looking for a pillow that didn't make him sweat when he slept. He liked the memory foam but in the winter they start out rock hard. I had used the shredded memory foam pillows and liked how they didn't harden in the winter. These had the gel completely surrounding the pillow. He said they are extremely comfortable and will be buying more in the future. These pillows are cool and comfortable to sleep on. I like these pillows for a restful night sleep, No tossing and turning for me anymore. I'd recommend these if your looking for a pillow that's cool and doesn't bunch up these are great. "Will this help if you sleep hot?" I sleep cooler with this pillow, but some nights I still wake up and have to flip it. 95% impovement. "Where can I find pillow cases that will fit thick Gel pillows ??" I think as long as the pillowcase match the sizes of the pillow you will be ok.
My regular pillow case(s) had no issues fitting this pillow. This item features an 100% cotton cover that is removable for machine washing. I like the shredded memory foam construction with the gel encasing. I tried this pillow a while ago in a store and LOVED it, but they were out of stock and couldn't one for me (it was a demo pillow at a mattress store). The price was great and I love free shipping. Shredded gel memory foam and cooling nature.